Looking for new construction, but don't want to wait? Here's your opportunity to have the best of both worlds!!! This Highland Homes Shelby floor plan in the desirable community of Amber Glen was completed at the end of 2017 and is move-in ready! At only $141.70 per sq ft, it features an open living area with a spacious great room, porcelain tile floors, open kitchen with an expansive breakfast bar, corian countertops, soft-close cabinets, full-extension pull-out drawers, energy star appliances, and large walk-in pantry. The Master bath has garden tub, walk-in shower, and separate vanities with 42"cabinetry. A great covered screened-in lanai with additional open patio for sunning. Home backs up to a very quiet 55+ community. The oversized 2-car attached garage has plenty of extra room for all of your toys and gear. SHOWS LIKE A MODEL HOME. 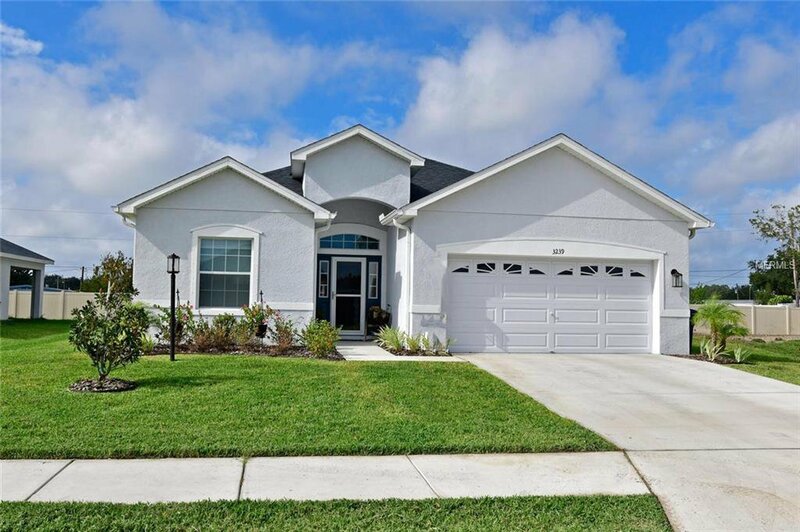 Great location close to Ellenton Premium Outlet Mall and I-275 and I-75 for an easy commute. See virtual tour link for a 3-D walk experience. Listing courtesy of MARCUS & COMPANY REALTY. Selling Office: CAREFREE REALTY INC.